Wrap around Deck with Mountain Views 4 Bedrooms Sleeping Families up to 14! Come spend an family vacation at this 4 Bedroom Home in the White Mountains of New Hampshire! Can sleep families up to 14 or 8 adults and pets allowed with owners approval. Great place to enjoy with extended family and friends! Have your Family Reunion on the Large Wrap Around Deck with Mountain Views! 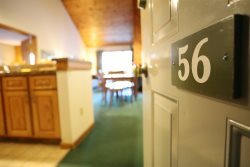 Privately nestled in the White Mountains with easy access to several family fun activities including Waterville Valley Resort! Lower level with bedroom and family room for the kids to escape to. Large Fully Equipped Kitchen to enjoy family meals and large living room to spend time enjoying the White Mountains of New Hampshire! Foosball table and plenty of board games to enjoy after your White Mountain Adventures. Or relax in the 2 person whirlpool tub in the Master Suite. So many adventures to do while you are here! Just down the road travel to Waterville Valley Resort where you can enjoy Corcoran pond with a beach to swim at and boat rentals! Cool off at the year round skating rink or play a round of golf at the Scenic Waterville Valley Golf Course. Clay Tennis courts available as well as several hikes for all abilities! Take a short day hike by the Mad River or go for an adventurous 4000 footer out of several to choose from! Be in Lincoln NH in less than 30 minutes where you can go on a zip-line adventure, take scenic gondola rides, aerial forest and much, much more! Enjoy this well maintained home whether you want to relax and spend time with family and friends or explore the White Mountains of New Hampshire! Allows families up to 14 or 8 Adults. Pets Allowed with Owner's Approval and $25/day fee. No Smoking Allowed iin the home or within 200 feet of building. Our experience with All Mountain Rentals was fantastic. Excellent communication and very friendly. Kathy especially was great! The minute we walked into our rental home my husband said, "Oh no! You'll never want to leave!" It turns out he was right. After four glorious days here, I wanted to move in, but unfortunately, that was not an option. Beautiful views, very spacious and light filled home which accommodated our party of 12 perfectly, plus our dog. Couldn't have asked for a better experience. Thank you! Easy to work with. Responsive. What a great experience we had working with the All Mountain Rentals Team! They helped us with everything from finding a perfect vacation rental for our group of 14 to discounted tickets for skiing for our families! This home was perfect for our group of 14! There was plenty of space for everyone to have their own space and a great main floor that had areas for eating, conversation and watching movies and playing family games. Lots of great memories were made here and we will be returning again for more soon!